What is Flip City like? A quick paced deckbuilding game with a particular flipping element and a press-your-luck/gambling mechanic. All players start with the same deck, and have the same pool of cards to pick from. Cards provide gold, victory points or unhappiness, and each side of each card has a special ability, such as extra buy or flip actions (more on those later). During their turn, players get to play the top card of their decks, and continue playing cards until they choose to stop, or until they accumulate 3 unhappiness points (which ends their turn immediately). Why would they play a card with unhappiness if they can see it already? Glad you asked, everyone starts with 4 Residential Areas, which MUST be played if they are on top. Other cards later on also force you to play the next card. 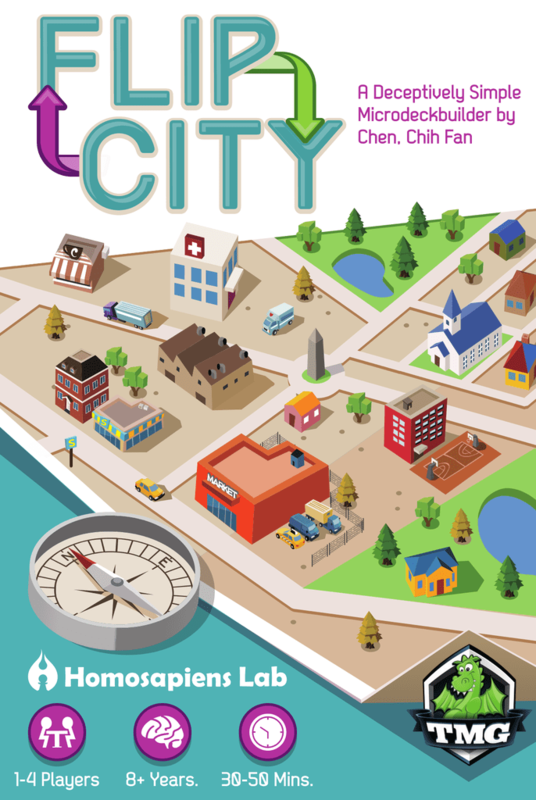 The game ends when someone has the best city (8 victory points) or the biggest (play 18 cards in a single turn). Undeniably fun for anyone who likes deckbuilding, with the press your luck element for extra thrill, make for a fast game that can be set up in minutes. For beginners, the rules explanation can be a bit mind-boggling, but after a couple of turns it “clicks”. When I learnt about the game, I summarized it as Dominion without all the setup hassle, and I still agree with that. Of course the downside to that is the variety of cards you get to play with, which can hurt replayability in the long run. The version I played already included the Office expansion, though (a new card), and more can be added in the future. An expansion is out with 2 new card stacks. Flip City leaves you wanting to play again, and again, just to try “one more strategy”, and the two different victory conditions keep the game interesting at all times. Flipping a building to develop it to the “next level” makes sense, when a Convenience Store becomes a Mall, for example. There are a couple of cards which are an odd choice, though (i.e. Hospital > Church). Flip City has a particular art style, but it looks great and it works for the game. Good quality on the cards, strong, solid cards that could probably be used without sleeves (but who would! :p). I leaned towards 3, but the game is really easy to set up and teach, so settled for a 2. Do not be deceived, however, it does not sacrifice too much depth to be so accessible, and experience with it certainly puts a player at an advantage.